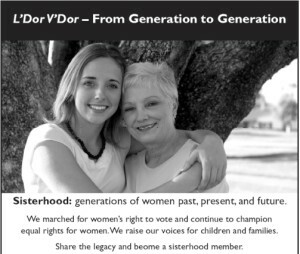 Women of TBE is an affiliate of Women of Reform Judaism (WRJ), an international federation of more than 500 Sisterhoods with over 65,000 members. WJR provides resources for social and political activism and the spiritual and intellectual growth of its affiliates. From its beginning in 1976, Women of Temple Beth Emeth (then TBE Sisterhood) is dedicated to involving its members in Judaism, social action and fellowship. We provide a variety of religious, educational, and social programs for the TBE and Ann Arbor communities, serve as an important fund-raising organization for TBE, and act as a link to the regional and national WRJ organizations. 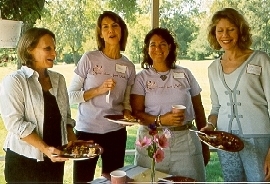 Active volunteers make for a friendly and welcoming way for women to engage in TBE community life. Non-TBE members and men are also welcome to join and support us. Our dues to WRJ fund projects such as early learning centers in Israel, the North American Federation of Temple Youth (NFTY) and scholarships for the education of Reform rabbis at Hebrew Union College. TBE congregants, through WRJ, are patrons of the World Union for Progressive Judaism and JBI (formerly the Jewish Braille Institute). WTBE starts the year big by sponsoring the congregational Break-the-Fast. Sweet Beginnings, an award-winning “welcome to religious school party,” is held for new students on the first day of Hebrew School in the fall. Each bar and bas mitzvah receives a kiddush cup from WTBE, and college students receive gift packages at Chanukah and Purim. First-time Jewish campers are eligible to receive scholarship support at a URJ camp. WTBE contributes to the TBE Youth Advisor’s salary, to AARTY convention travel, and provides additional funds for special activities to the TBE religious school. The entire Jewish Community is welcome to shop at the WTBE-run TBE Gift Shop which carries a wide variety of Judaica in a broad price range. The shop is open Mondays and Wednesdays during Hebrew School, Fridays before services, and Sundays, 5:30–7 p.m. It is also open by appointment; contact Amy Paberzs (668-6842; amypab@hotmail.com). And don’t forget those Hamantashen come Purim. A number of local non-profits receive donations or support through WTBE. Through the WRJ affiliation, we contributes to rabbinic and cantorial scholarships at the Hebrew Union Collage in the US and the Leo Baeck Institute and Abraham Geiger College in Europe; the Jewish Braille Institute; the World Union for Progressive Judaism (WUPJ); and several Reform nursery schools and Bas Mitzah classes in Israel. WTBE/WRJ is part of TBE’s Social Action agenda and will be providing programs and advocacy that ties into this year’s Social Action activities. WTBE board members benefit from WRJ leadership training and resource sharing at district and national meetings. In addition to these programs, the group has informal monthly lunches, afternoon and evening mahj groups, biweekly Women’s Torah Study, periodic lectures, workshops, trips and activities. This year’s welcoming brunch will be held Sunday, September 28.
for membership in WTBE and WRJ are your choice of $54, $72, $108, or the basic membership of $45 per year. Your choice of a higher membership rate means more support for our many programs. For more information about Women of TBE, contact the TBE office by phone or visit our web site, or simply send us a check for $54 or more (options- $72, $108 or basic membership at $45), payable to “WTBE”.